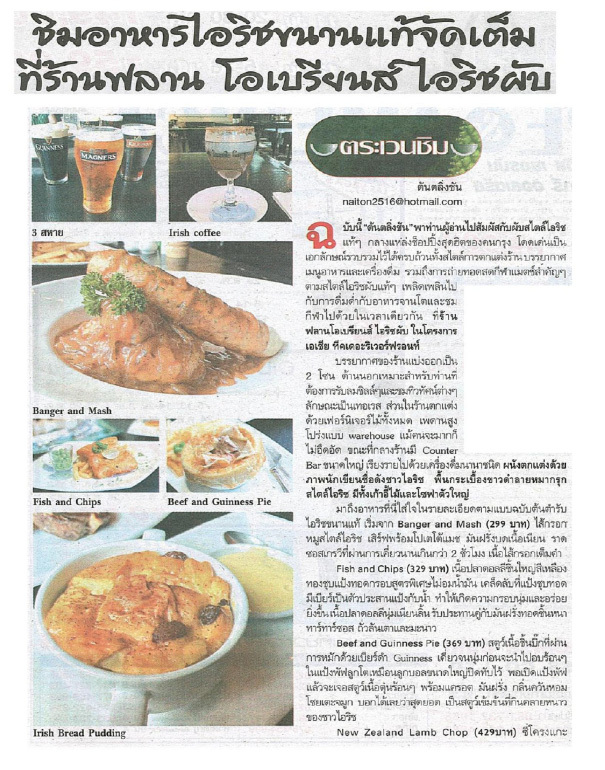 This issue I bring all readers to experience an original Irish Pub at Asiatique The River Front. With its decoration and atmosphere as well as food and the drinks, you can enjoy the original Irish feeling. For sport lovers should not miss to come because there’s a big screen for live sport show. Flann O’Brien’s Irish Pub at Asiatique The River Front. dressing. Next is Fish and Chips (329 baht) dory fish fried with Guinness beer, crunchy and yummy with Tatar sauce dipping serve with French fries. Beef and Guinness pie (369 baht) big chunk of stew beef with Guinness beer as a main part, top with tasty pie. New Zealand Lamb Chop (429 baht), big lamb rib serve with salad and gravy sauce in Irish style. For alcohol lover, there so many kind of drink you should not miss to try out, such as beer, cocktail, whiskey from all over the world. The signature drink is Guinness and Kilkenny, draught black beer imported directly from Ireland. For coffee lover, it is a must to try Irish coffee, a smelly coffee with Jameson on fire. There is Thai food available for foreigner who wants to try out Thai dish, features Pat-Thai, Shrimp Tom yum and fried rice. The restaurant caters the party and event within the restaurant. Live music is available on Saturday night from 19.00 hrs. onward. Flann O’Brien’s Irish Pub at Asiatique The River Front opens daily, Monday-Friday from 15.00-23.00 hrs. Weekend from 13.00-24.00 hrs. Located in Asiatique Warehouse 10, Charoen Krung Road. For information and reservation please call 02-1084005, 021084006. There are three more branches of Flann O’Brien’s including IMPACT, Silom and Thonglor.